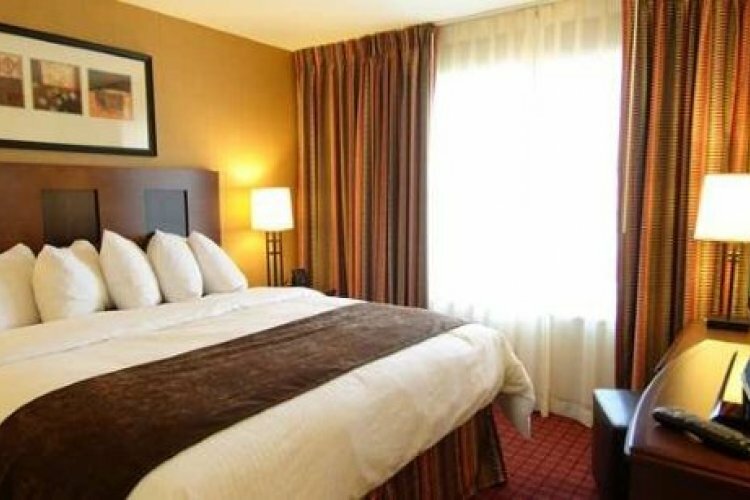 The Embassy Suites Anchorage Hotel is located conveniently in midtown Anchorage in Alaska. The all-suite hotel is less than 5 miles from the Anchorage International Airport and within easy reach of Anchorage's most popular attractions. These include the Alaska Zoo, Alaska Centre for the Performing Arts, hiking or biking along the Tony Knowles Coastal Trail and Alaska Native Heritage Centre. Each luxurious suite is perfect for business or leisure travellers and has a separate living area, high speed internet access, a 32-inch high definition TV, microwave and mini-refrigerator. Certain room options also contain a 42-inch plasma TV, whirlpool tub or two baths. The comfortable rooms have well lit work/dining tables, wet bar, coffee maker and telephone system with voicemail. A complimentary cooked-to-order breakfast is available suiting the needs of guests who may wish for a sit down service, calorie counted dishes or just something to eat on the go. A complimentary evening reception will allow guests to wind down or get ready for a night out with a variety of alcoholic and non-alcoholic drinks and light appetizers. The Pi Kitchen and Bar is available for lunch and dinner services with Alaskan seafood specialities, American classics and special cocktails. Amenities at the Embassy Suites Anchorage Hotel include a business centre, meeting rooms, coin laundry, valet service, room service, a well-equipped fitness room, whirlpool and swimming pool. Business events and weddings can also be catered for at the Embassy Suites Anchorage Hotel with a variety of spaces including ballrooms and salons that may seat a few hundred guests. The Embassy Suites Anchorage Hotel can help plan your wedding from ceremony to reception.